Scooters at skateparks. All the Rage! Scooters in skateparks are often a problem for other skatepark users. Many skaters cannot stand them. The kids on them often pay no attention to others. Young and unaware that other people are using the park. They dart around and cut off traffic, stand in the way of the most used areas and snake. These young park users need to pay attention and let others ride. 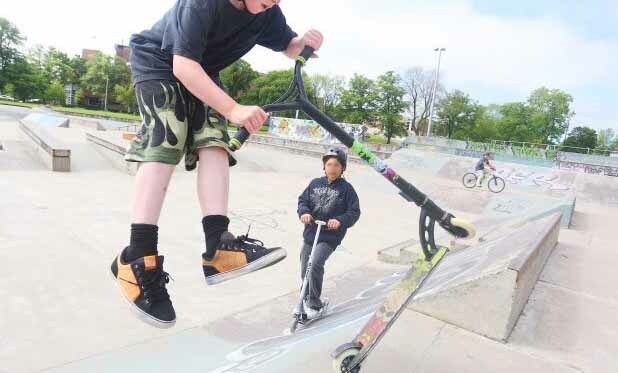 I don't like how young scooterers and bikers use skateparks. Its not because they chose a scooter or the bike instead of a skateboard. It is because they don't look. I have the scars to prove it. Many times a young one would drive right into the halfpipe when I am in my run. Crashing into the back of me. Skaters don't look too, but unlike scooters they are slow moving. "Look both ways before you cross the road" try look all ways before you move at a skatepark. Most skaters do this. They don't want to be snaked nor do they want to cut off others. Scooters users don't look. They just go. The first time I saw a scooter a popular 90's skater; Sean Sheffey was debuting it at Slam City Jam. The big contest of the day. He rolled around the course with it. He was a cool skater so skaters thought it was cool too. 20 years later; scooters are not as cool. A well intentioned parent will see their son or daughter rolling around on a scooter at home. They might think that it is time to take them down to the skateboard park. That is the mistake. What they don't know is that skateparks have rules and etiquette that keep them safe and usable. Just like the rules of the road. Taking the young scooter-er to the skatepark without teaching them the rules is dangerous. For the kid and the rest of the skatepark. This also applies to kids on bikes. A downside is that these rules are not posted or understood. Most learn them through experience at a park. The typical way is to get in the way. Get yelled at. Or worse cause a crash where someone gets hurt. I'm not saying that this is a good way to learn. I think we can do better. A skatepark is a place where people of all ages move in patterns around the obstacles. Designed for skateboarding. There are curves and ramps that make them attractive for anything on wheels. To roll at a skatepark you need to be aware of the people around you. Everyone wants to go wherever they want, all at once. This can't happen though. On the road there are rules to follow for safety. Just like in traffic. There are places to stand and times to take your turn. Always look before you go somewhere. Someone may already be going there and that means you need to wait. If you don't wait, you risk a crash and getting hurt. Angering the person you cut off or worse, hurting them. You may get run over because the person whose turn you cut into was going fast. When taking your proper turn you are not expecting to be snaked or cut off. No one likes a snake. The skatepark rules keep the skatepark safe for all riders. The rules also make it possible for everyone to have a turn no matter what their skill level. Yes, that means that even the older riders will stop to allow the young kid to have a turn. Scootering is easy to do right away. Skateboarding is not. You do not have to learn how to ride a scooter. You can hop on and roll. This makes them great for young children. They can get a scooter and start rolling around right away. In contrast a brand new skater struggles to even stand on a skateboard. A new skateboarder does not move quickly. Zipping all around takes a lot of practice. A new skater has to learn so much before they even think about going to a skatepark. Not so for a scooter. You can jump on and within a few minutes you are fast enough to menace the streets. That doesn't mean that they are ready to roll in a busy skatepark. All skatepark users need to know how to watch for others and stay safe. Without knowing that scooters clutter up the area. Skaters who have put in a lot of time and skill are trying to have a good time. Then the unsupervised 6 yr old scooter flies in the middle of traffic. The scary part about scooters is that most scooter riders have no idea about these rules. They roll around in all directions not paying attention to anything. They start, stop and turn in unpredictable ways. Often in a place that is unsafe for them and the other users of the park. I can’t count how many times a scooter kid has gone right through a place where skaters were lined up to use a feature. This disrupts the flow of the park and makes people angry. Skaters doing a tricks that are dangerous. Then a scooter kid flies in the way causing them to fall and hurt themselves. The scooter kid rolls away not even knowing that they caused someone to hit the ground, hard. This is because they haven’t left the womb yet and don’t know that other people matter too. This make them a menace. I pay taxes! My kid deserves to use this park! Well no, not really. That doesn't account for the real picture. You or your scooter haven’t invested the time that others have. Many skaters work for years to get a skatepark. They also invest hundreds of hours into learning to skate. They follow skatepark etiquette when they skate. A kid with a scooter has not done any of those things. They just show up and create chaos. This added effort gives skaters respect for other skaters who are good. The first trip to a skatepark is often a tough experience. It is a gauge of just how good you are not on a skateboard. Often leaving the new skater standing on the side watching. Too nervous to even roll in front of others. They get better and come back ready to start skating the park. This causes new skaters to watch and see what other skaters are doing. Learning the way the park works before they have a chance to zip around and cause problems. This rite of passage doesn’t happen for the sports where you just hop on and go. Scooter kids hop on and go. They ride all over and get in the way. No time watching and learning what is going on. This creates a dangerous situation where these young kid get in the way and often get hurt. There is a segment of scooterers that have gotten good. Its great that they are pushing the tricks in a new sport. I don't mind skating next to them. Provided the wait there turn like I do. Scootering is not as challenging as skateboarding. To skaters using your hands is lame. That can make it hard for even good scooterers to earn respect. Skaters don’t respect those on scooters or rollerblades because it is too easy. You can use your hands. By comparison skateboarding is hard. Just learning to roll takes a lot of work. Getting off the ground with an ollie is a huge skill to learn. That is why skaters don’t respect other sports. They are just too easy. We have to share Skateparks. ...who are they to clutter the park we skaters worked so hard to have? Well, resisting the crowds of scooters won't stop them from coming. We have to adapt. Many of us worked our butts off to get skateparks. Now we have them. As leaders it is our role to share them. We need to share them. If there is room for skateboards then lets make room for scootering too. The heart of the issue for me is that governments spend tax dollars on skateparks. This money come from everyone. So these parks are for everyone too use. Teaching new users how to use the park is a growth experience. For the scooter kids and the gnarly old skaters. It is frustrating as hell many times. But please try teaching in a manner that doesn't involve yelling or smashing into people. That is something worth doing.